Something is wrong with the moon dial. Explore Castle Volkihar's Ruined Tower. (If not a vampire) Become a Vampire Lord or get partially soul trapped. Serana will want to speak to you after the Moth Priest reads the Elder Scroll, saying she may know where to find one of the scrolls. She thinks her mother, Valerica, may have information on it, and possibly may even possess it. After going through her dialogue, Serana believes Valerica may have left a clue at Castle Volkihar, in the courtyard. You will not be able to enter through the Keep, but there is a secret entrance used by the previous owner to obtain shipments. Note that if you have a follower at this point, you must dismiss them. Simply telling them to wait is not enough. Serana won't accompany you unless you send your follower home, and you'll need her later on. When you reach the castle, head left, along the coastline. Serana will mention you're getting close to the entrance. When you reach the castle's old docks, you will be attacked by skeletons (more powerful than average skeletons). Once you enter through the secret entrance to the castle, you will have to fight your way through death hounds, skeletons, and a feral vampire. After dealing with the feral vampire, you will arrive at a stone archway blocked off in the western corner of the room. Ignore this for the time being and proceed instead up a set of stairs on the opposite corner of the room, which will lead you to a lever needed to lower the bridge blocking passage through the stone archway. Once on the bridge, take a left as instructed by Serana. This leads into an open area inhabited by death hounds. Afterwards move up the stairs in the southern section of the room which takes you into a tunnel. Eventually you must fight a giant frostbite spider and pull an additional lever to lower a bridge, allowing access to the courtyard. Just before you hack through the web to reveal the giant frostbite spider, there is an adept-locked chest to your right hidden behind more spiderwebs. If you don't go right into the room ahead, the giant spider can be killed with long-range attacks as it's too big to come down the small tunnel. 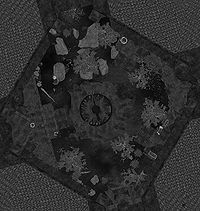 When you reach the courtyard Serana will tell you there is something strange about the moon dial, and you have to find all three missing pieces and place them in the moon dial for a secret entrance to open. The Half Moon Crest can be found in the center of a pond lying against a rock in the northwest corner of the courtyard. The Full Moon Crest can be found behind a patch of nightshade lying against the castle's exterior wall in the fenced off area identified as Valerica's garden. The Crescent Moon Crest can be found up the stairs just to the right of the entrance to Volkihar North Tower lying on the floor beside a table and chairs. The Finely Ground Bone Meal is on the table by the entrance beneath the mammoth skull. The Soul Gem Shards are on the first wardrobe up the stairs that head to the left. The Purified Void Salts are on a shelf with other ingredients, near the farthest point of the raised area of the room, on the balcony above the entrance. All of these items are in silver bowls, which will not be added to your inventory when you pick them up. These are the items you must have; normal bonemeal, soul gem fragments, and void salts will not work. Find them and place them in the vessel in front of the portal (Serana will typically wait for you beside the vessel, making it easier to locate). 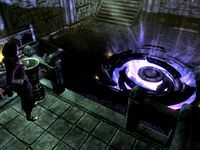 Serana will then add her blood to the mixture and the Soul Cairn portal will start to open. If you are not a vampire and you attempt to enter the portal, it will leech some health, so return to Serana. Allow her to turn you into a Vampire Lord. Allow her to trap part of your soul in a soul gem, which will add the Weakened Soul effect, causing you to have 45 points less of health, stamina, and magicka and reducing their regeneration rates while in the Soul Cairn. This is the only way to enter the Soul Cairn without becoming a vampire. The effect is removed once you find the Soul Essence Gem. Choosing either will allow you to enter the Soul Cairn. While this quest or the quest Beyond Death is active, you will be unable to dismiss Serana from your party. Though the option to part ways with her is present, no matter how many times you click on it she will remain a quest follower until this quest and the following quest are over. If you are on the Dawnguard side and are a werewolf, this can be extremely frustrating if you use Beast Form and have the Savage Feeding perk as Serana tends to raise corpses in battle, thus disallowing any feeding to extend bloodlust. For this reason, it is strongly advised not to use Beast Form at all. It is not necessary to be a Vampire Lord to enter the Soul Cairn without needing to be soul trapped. Being a regular vampire works as well. If you side with the Dawnguard, you may choose to become a normal vampire for the duration of this and the next quest, then cure yourself after leaving the Soul Cairn. However, if you've entered the Soul Cairn for this quest as a vampire, you will have to be a vampire on subsequent trips. From the courtyard you have access by door to two more zones, the north and east towers. The east tower is empty with some minor loot (gems and coin), the north tower has a few skeletons and a gargoyle plus also some loot. Once the quest ends and you emerge from the portal, the fastest way to leave the castle is to exit through the door that leads to the "Castle Volkihar Balcony". This is an outside area that can be fast-traveled to and provides easy access to the Soul Cairn without having to traverse the castle ruins and the courtyard again. If you use this door before entering the Soul Cairn, Serana will stay in the study even if you fast travel, making an exception to the above rule about dismissing from party. There is a chest convenient to the door so that one can load up to maximum weight minus one, fast travel to merchants and repeat, as well as visit trainers, do other quests, etc. There is a small window of opportunity to acquire two followers here, Serana and one other. From the point where Serana is waiting for you to fill the vessel with the special ingredients, until you decide whether you want her to turn you into a Vampire Lord or capture your soul, you can leave via the balcony door. You now have the opportunity to leave the castle grounds and recruit another follower. Once you do and fast travel back to the castle balcony, Serana will automatically rejoin with you and your follower will not be dismissed. Your follower will not enter the Castle (neither will a dog companion). However, when you finish with the Soul Cairn and leave via the balcony again, your recruit will still be there waiting. Serana will continue traveling with you. If you take advantage of this one opportunity before completing "Stage 100" below, you can have two followers for the rest of the game. You will still be able to change the 'normal' follower, dismiss him or her and pick another instead, continuing to have two followers in the group, but you can't dismiss Serana. If you dismiss her this opportunity will be lost. You will lose the second slot on entering the Ancestor Glade for that quest, however there will be a second opportunity at the end of 'Touching the Sky' immediately after you kill the boss for that quest to fast travel elsewhere and return with a second follower - at which point you'll have a second slot for the rest of the game, although it's recommended not to dismiss them until you've killed Harkon at the end of Dawnguard and returned to normal game areas. Dismissing Serana at any time will always eliminate your second spot so don't do it, ever. Choosing to become a Vampire Lord and then returning to Fort Dawnguard will prompt Florentius, Sorine, or Gunmar to direct you to Falion, thus beginning the quest Rising at Dawn. Other Dawnguard members, including Isran, will regard you with caution and disgust. You will not be able to use the Dawnguard's services until you cure yourself. When asked to put the ingredients inside the vessel, they will be removed from your inventory, but the vessel will not be filled, and Serana will keep telling you to put the ingredients in, causing the quest to be unfinishable. ? It is possible to manually advance to the next stage of the quest by opening the console and typing setstage DLC1VQ04 75 . This can also be caused by multi-follower mods. Typing 'set playerfollowercount to 0' will let the quest continue normally. Once back out of the Soul Cairn set the value back to the number of followers you have. When asked to speak to Serana after putting the ingredients inside the vessel, speaking to Serana does not advance the quest. It is possible to manually advance to the next stage of the quest by opening the console and typing setstage DLC1VQ04 80. Dead Thralls cannot enter the Volkihar Courtyard. Entering the Courtyard can cause the thrall(s) to vanish from the game after returning from the Soul Cairn. Kill and leave the bodies of the thrall(s) in a safe place before entering the Courtyard. When Serana asks for the journal, it might not be removed from your inventory. ? It can be dropped or stored once you rescue her mother and return from the Soul Cairn. You may not be able to enter the Soul Cairn. Open the console and type set DLC1VQ04SoulTrapped to 1. 10 Dexion's reading of the Elder Scroll has given rise to more questions than answers. The Moth Priest saw a vision of a weapon called Auriel's Bow, but Serana and I need to locate two more Elder Scrolls in order to unravel the rest of the prophecy. 20 Serana has indicated her desire to locate her estranged mother, Valerica, who had fled Castle Volkihar with one of the Elder Scrolls. She believes that Valerica may have left a clue to her whereabouts somewhere in the courtyard of the castle. In order to avoid detection by Harkon, we've decided to utilize a hidden entrance on the back side of the island. Serana has indicated her desire to locate her estranged mother, Valerica, who had fled Castle Volkihar with one of the Elder Scrolls. She believes that Valerica may have left a clue to her whereabouts somewhere in the courtyard of the castle. In order to avoid detection by the castle's vampires, we've decided to utilize a hidden entrance on the back side of the island. 35 Serana and I are trying to locate her mother, Valerica, who may have one of the Elder Scrolls. 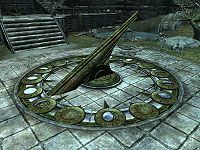 Our journey has taken us to the courtyard of Castle Volkihar where we've discovered a hidden entrance underneath Valerica's old moondial. 50 Serana and I are trying to locate her mother, Valerica, who may have one of the Elder Scrolls. Our journey has taken us beyond the courtyard of Castle Volkihar where we've discovered a hidden entrance underneath Valerica's old moondial. After exploring the ruined tower beyond, we've stumbled across an old alchemy laboratory. Serana is convinced her mother has hidden some notes that may yield a clue as to her whereabouts. 60 Serana and I are trying to locate her mother, Valerica, who may have one of the Elder Scrolls. Our search has taken us to Valerica's laboratory hidden within the ruined tower at Castle Volkihar. According to Valerica's notes found there, she has likely fled Tamriel and entered the Soul Cairn, a dimensional plane of Oblivion. In order to pursue her into the Soul Cairn, Serana and I need to recreate the experiment that opens the portal to this strange place. 90 Serana and I are trying to locate her mother, Valerica who may have one of the Elder Scrolls. In Valercia's laboratory, we've recreated an experiment she performed and opened a portal to the Soul Cairn, a plane of Oblivion. Serana believes strongly that her mother is inside this strange place and has indicated we should step through. 100 When attempting to step through the portal to the Soul Cairn, a hidden force that seems to be draining my life energy is preventing me from entering. I have two choices if I wish to enter the Soul Cairn. I can allow Serana to change me into a vampire, thereby "killing" me in effect. Alternatively, I can allow her to partially soul trap me which could potentially weaken me while I roam the Soul Cairn. 200 Finishes quest Serana and I have stepped from Valerica's laboratory on Tamriel to a plane of Oblivion known as the "Soul Cairn" in order to find her mother Valerica. Serana strongly believes if we can find her, she will be able to tell us the location of one of the Elder Scrolls we need to decipher the Tyranny of the Sun prophecy. The following empty quest stages were omitted from the table: 0, 1, 25, 40, 45, 80, 110, 111, 112, 115. On the PC, it is possible to use the console to advance through the quest by entering setstage DLC1VQ04 stage, where stage is the number of the stage you wish to complete. It is not possible to un-complete (i.e. go back) quest stages, but it is possible to clear all stages of the quest using resetquest DLC1VQ04. This page was last modified on 25 March 2018, at 02:27.